At Riksbron bridge in Stockholm, Sweden, every Thursday between 11 and 12 o'clock, there is a group of devoted people who fight for land rights, clean water and a living cultural heritage. In all weathers, they stand up for the rights of indigenous peoples and protest against Sweden’s current mineral regulations. On Thursday, October 26th, Pierre Åhrén received the International Indigenous Unity Flag. The International Indigenous Unity Flag is an international symbol uniting all indigenous peoples in world peace calling for the need to unite to protect indigeneity and the planet earth (mother nature). The flag was created in 2012 by aboriginal Canadian, Col. Michael Lawrence Sher, one of the commissioning founders of the organization Globcal International. Tidningen Gränslöst is a magazine published in Sweden, this article was published original article: "Riksbron every Thursday"
Pierre Åhrén became a Goodwill Ambassador for Indigenous Peoples Unity. 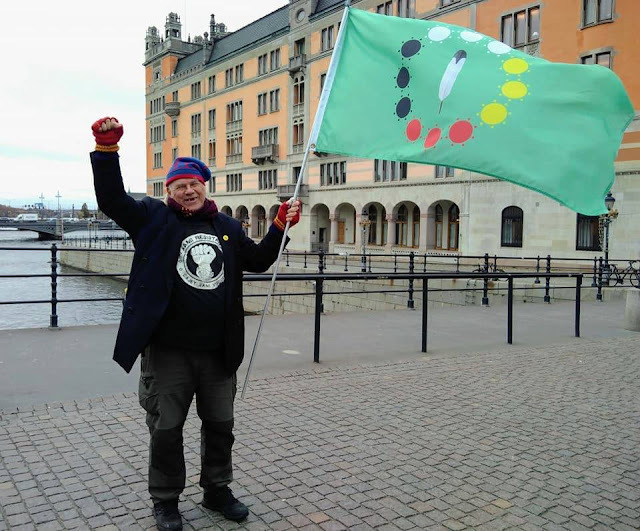 After demonstrating for 3 years with a homemade banner of the International Indigenous Unity Flag on Thursday, October 26th, Pierre Åhren received a genuine flag, representing unity among indigenous peoples, world peace and how we must become united to protect our planet. The gift was facilitated by goodwill ambassadors of Globcal International. Pierre Åhrén explains the background to the activities that take place on the Riksbron bridge every Thursday. It all started in November 2013 when activists demonstrated against the mining project in Gállok outside Jokkmokk during the summer. When Pierre stood there demonstrating he came to think of the women in Argentina, Madres de la Plaza de Mayo, whose children disappeared between 1976 and 1983, and who march on Thursday every week. Pierre decided that he also can march once a week, on Thursdays, and other people followed him. Pierre is on the bridge half an hour before the other demonstrators arrive to prepare the activities. Through the years, they have had protest placards supporting different peoples and places in the world, for example Brazil. The purpose is to protect the earth from deforestation and destruction. The mining industry is poisonous to nature and contaminates our drinking water. The mass consumption society is destroying our planet. If you follow the chain starting from the mine in the mine you extract metals, from the metal things are made that people should buy, then the things are thrown away and new things are bought. This is going on all over the world, says Pierre. In Sweden, many of the mines are located in the Sami reindeer herding areas. Despite the severe problems with the mining industry, Pierre is quite hopeful when it comes to young Sami people. He means that young Sami people readopt the Sami languages and the Sami art. The young Sami people are the ones who feel the urgent need to protect their cultural heritage. When talking about the Indigenous Unity Flag and the event on the Riksbron bridge on October 26th when Pierre Åhrén received the flag from Erica Lundström, he gets emotional. I feel kinship with all the world’s indigenous peoples. On October 26th Pierre Åhrén was awarded a medallion to acknowledge and recognize his contribution to the advocacy of human rights and future of indigenous peoples in Sweden.